Welcome! If you've already been here to my blog several times today, I congratulate and thank you. Yes, I'm sharing quite a few posts today; but I absolutely LOVE making coffee projects to send/give to my coffee-loving friends, so I just can't help but make LOTS of projects to share in these fun challenges! This tag was cut from a wood-grain patterned paper using a Reverse Confetti tag die. I cut some wool felt leaves with a PTI die, and I topped it with some ribbon, Brown Burlap String, and some little holly berries. 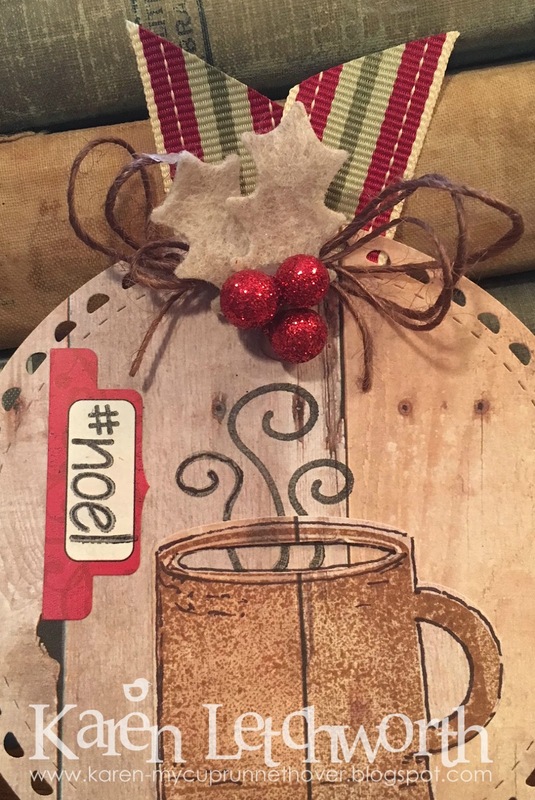 The stamped coffee mug image is from Paper Sweeties as well as the steam coming out of the mug and the sentiment( #noel). I stamped the #noel on a small sticker from an Echo Park sticker sheet. I'll be using this as a gift tag on one of my daughter's Christmas gifts. Thanks again for stopping by! 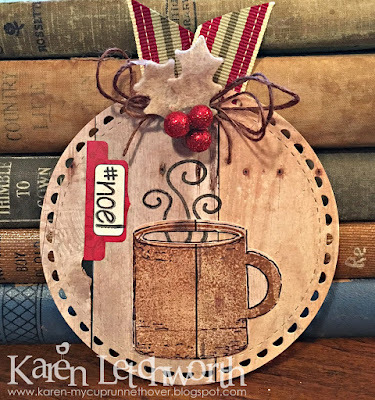 Lori Hairston's Visions of Sugarplums Challenge - I'm happy to share all my "yummy" cards. Coffee is always a "vision of sugarplums" for me! So nice to see the woodgrain touch on this cute tag! Awesome! Love the woodgrain and that Reverse Confetti die is one of my favorites! Gorgeous tag! Love the rustic touch, the dark twine/thread and those pretty berries! Thanks for hopping along with us! This is wonderful - you have inspired me! Wonderful tag and I love the outer design on it. You sure know the right things to add to make it beautiful! Awesome woodgrain tag! love that Paper Sweeties mug. Amazing tag, love the vintage feel! The vintage look of the card is so beautiful. Gorgeous ribbon. Love the wood grain, the felt leaves and the ribbon.